C.A.O. cigars are hand made in the Dominican Republic using only the finest of super premium tobaccos, along with the highest quality natural extract found in the world. The corona size is 5.25" x 42 ring. Wrapped in a cedar sleeve and Sealed in Cellophane. Offered at $4.60. The C.A.O. Bella Vanilla uses only the highest quality vanilla beans found in Madagascar, recognized as the finest source for vanilla in the world. The complex flavors of these delicate, exquisite vanilla beans are imbued into a blend of rich Cuban seed tobaccos. The result is the most sophisticated and complex cigar of its kind... a subtle, well-balanced cigar that yields a rich and layered complexity of flavor with an intoxicating aroma. The C.A.O. Gold Honey uses the highest quality orange blossom honey in the world. The honey is derived from single floral honey that's exclusively from the best orange groves in Florida. The buds produce a sweet nectar secreted only in Spring. C.A.O. compliments this wonderful honey with the finest tobaccos, which results in a delicate blend that has a bright, faintly citrus flavor. C.A.O. Moontrance is an intricate and unique blend of 100% all natural exotic fruit and bourbon vanilla extracts. Bourbon vanilla, a type of vanilla bean renowned for its caramel-like sweetness, is married with ripe Georgia peach nectar and then mixed with other organic fruits. A splash of white honey from Hawaii is added for tropical essence. This well-rounded blend is complimented with an exquisite blend of mild and rich tobaccos featuring C.A.O. 's Grade One Cameroon wrapper. C.A.O. Eileen's Dream is a combination of Irish Cream and white chocolate truffles. Superior Irish Whiskey, frothed cream, and coconut milk composes the Irish Cream. The delicacy of white chocolate truffles is a subtle mixture of hazelnut paste, white chocolate, ground almonds, cocoa, and vanilla extracts. This avalanche of flavors is infused into a cigar with a Grade One Cameroon wrapper and mild Dominican filler to complete this five-star reverie. "Irish Eyes are Smiling"
C.A.O. EarthNectar pays homage to the earth and the rich area of Italy's famed Tuscany region. An all-natural mixture of toasted almonds, cocoa, honey, and raisins are combined with the finest infused chianti. This blend is complimented by a Cameroon wrapped cigar and Cuban seed Dominican filler to achieve a mild, satisfying smoke. C.A.O. KarmaSutraSplash is an intoxicating mixture of perfectly ripened Hawaiian mango nectar and the soothing, fresh sweetness of chocolate mint ice cream. Subtle hints of orange, green apple, anise, and cookie dough are also added to provide depth and mystery. This stunning combination is partnered with Grade One Cameroon wrapper and mild Dominican fillers. The Famous Rum Runner, West Indies Vanilla, and Island Amaretto are hand-made cigars using long-filler, premium tobacco cultivated in the most fertile regions in the world. Made in Indonesia. Try them and you will agree that they are a remarkable experience. 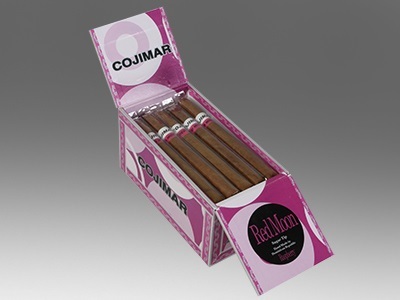 Cojimar cigars are handmade in the Dominican Republic using premium Piloto Cubano Dominican long filler with an Indonesian wrapper. These sweet and aromatic smokes have a sweet sugar tip. 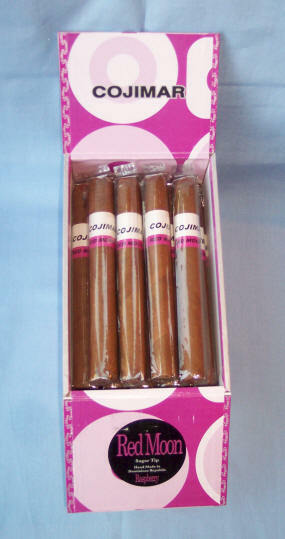 Enjoy Cojimar flavored cigars and have a pleasant, mild and affordable smoking experience. These handmade flavorful cigars are imported from Dominican Republic. The flavoring process is one of aromafication and then injection for additional flavor. Size is 5.5" x 42 ring. Individually sealed in cellophane. Offered at $2.50. Cuban Honeys are made with all-natural flavors. 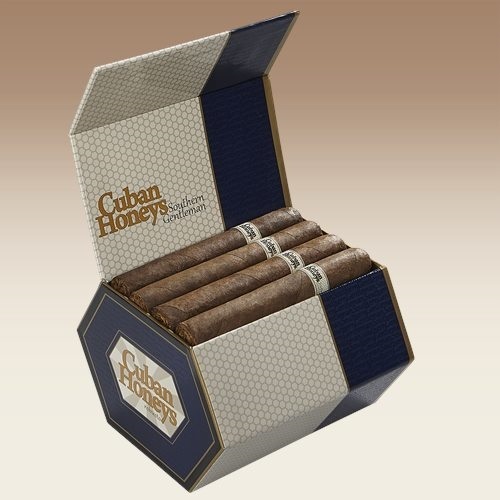 They are mild-bodied cigars made with Cuban-seed tobaccos from the lushest soils in the Dominican Republic. 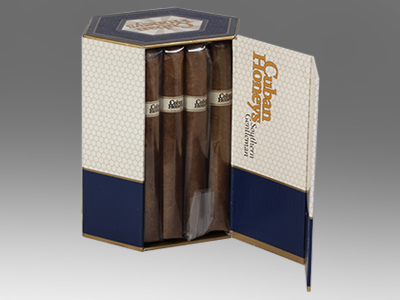 These handmade cigars pair ultra-premium tobacco with new mouthwatering flavors which are smooth, mild, and aromatic. The binder and filler are Dominican and the wrapper is Sumatran. Size is 5.25" x 43 ring. Cuban Honeys Drunken Truffle has a completely different flavor combination which includes coconut, chocolate, Irish cream, French vanilla, and whiskey. Smooth, sweet, and tasty. 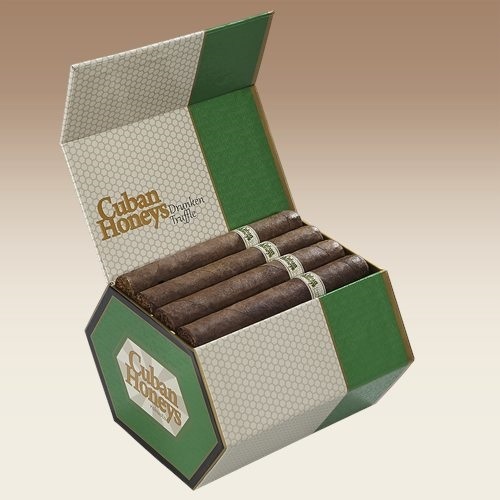 Cuban Honeys Southern Gentleman has an intoxicating blend of ground vanilla bean mixed with exotic fruits and a touch of bourbon to deliver a pleasant sweet citrus flavor with aromatic vanilla.